I’ve mentioned that getting out of debt is hard. You know what else is hard? Staying out of debt. It’s not all downhill and carefree once the debt is gone. We still have to work every week to not make impulsive choices, to trust God, and to stay focused on our budget. I didn’t expect that. Sometimes I wonder if things really ever do get easier. But I know, without a doubt, working so hard and paying off all that debt was worth it. Our lives are better, freer, less stressful, and more peaceful because of the journey. 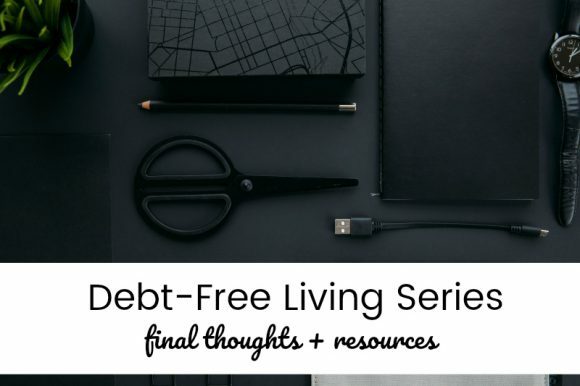 As Christians, it’s important to remember two things about living debt-free: 1. It’s about obedience and financial stewardship. We have to be responsible for what we’re given. And if much has been given, much will be expected. 2. When we are free from the stress and burden of debt, we get to do what the body of Christ is supposed to do; we get to help others, bless others, support others. This isn’t about paying off bills and then hoarding money, traveling the world, and filling our closets with new clothes. It’s about understanding need versus want and then opening our eyes to where we can be the hands and feet of Jesus. I have experienced firsthand the body of Christ stepping up when things were tight and easing burdens. I pray I never forget the kindness, humility, or compassion others have had on us as we limped through 2017. We have been given much and much is expected. I take that responsibility serious. I would challenge you to do the same. Also, it’s not something I want to write about on the internet, but if you’re personally invested in our lives, ask us what we’re doing with our money. Hold us accountable as we work to get our finances back on track. Ask us where we’re being generous and where we are seeing needs we can meet. It’s not always about money, but sometimes it is. I’ve gotten lots of feedback this week about this series. Much of it has been encouraging and exciting–so many people want to start (or continue) their debt-free mission. Some of the feedback hasn’t been so great–I’ve had people unsubscribe from my emails and felt the grumbles. That’s okay, truth is hard and sometimes it makes us mad. It doesn’t change truth, but, eventually, the truth will change us and I pray you’ll be open to living life honoring God with your finances. Money does not define worth. You are not your bank account, your job title, your college degrees. Your value is not found in your pay check, your lack of pay check, your loan amounts, or the size of your house. I love the phrase “careless in the care of God”. That’s what living debt-free is about. Being obedient to God in our financial choices and relying on Him to provide safety, security, abundance, and worth. For debt-elimination and money goals, a budget binder worked well for us. I’m pretty old school when it comes to paper and pencil, and I really like to see things written out. I still use (multiple) paper planners. I do not have an electronic calendar on my phone. I do not subscribe to that voodoo. I like to sit down with some pretty pens and write down my goals, plans, and to-do lists. But maybe that’s not you. Maybe you love a good spreadsheet or money-tracking app. There are a million to choose from–when you want to stick to a budget, find what works best for you and then really use it. Good intentions are great, but not magical. You actually have to do the work. Didn’t see that coming, did you? For me, the thing that changed my views on money, helped my attitude, and gave me encouragement was the Good Book. If you can’t get access to any of the other books I suggest, I’m assuming you can read this one. Do it. It’s really all you need. I’ve shared Lowe’s book many times. Her family has a powerful story of getting out of debt and real-life, simple things to start doing today to help your cause. I have not personally used this, but I’ve heard from multiple people (and this tech geek article confirms it) that You Need A Budget is the way to go. Their tagline is “Stop living paycheck to paycheck, get out of debt, and save more money” which pretty much sums up all our goals this week. I’m not one for paying money to save money (um, what? ), but if you know you’ll never sit down with your budget binder (which I find shocking, really), this might be the answer for you. I know there are other budget apps out there, maybe even some for free, but I have no advice to give about them (also shocking). You can try the YNAB app for free for 30 days so it might be worth checking out. Many churches put on financial peace or financial peace-like seminars for members and guests. It would definitely be worth checking out your church or area churches to see what offerings they have. We took bits and pieces from the above books and created a plan that fit our family and goals best. We had lots of great advice, listened to Godly counsel even when it hurt, and just stayed faithful to the task. Sometimes it felt like we were just treading water and then other times I could see the progress so clearly. I haven’t regretted the sacrifices once. I haven’t doubted for a minute what we were doing was right and God was blessing us and keeping us going. As I wrap up, I’d like to say something about talking to your kids about money. If we want to raise kids who are wise with money, it’s something we need to talk about sooner rather than later. For our kids, who are six and eight, we talk regularly about tithing money and offerings (money above the tithe that we give). We talk about when we’re sharing our resources with others who have less than us and why we do it. When we’re at the store, we talk about why we’re buying some things or not buying other things. As they get older, we’ll start asking them to tithe money their making and save a portion too. When I was younger, my parents made us save 20% of our earnings (babysitting, allowance, etc.) and give 10% to church. This was an ABSOLUTE TRAVESTY and I hated every minute of it. I will be continuing that child abuse with my own children. Our children know they have college savings accounts and understand that most of the money they’re given at Christmas from grandparents and great grandparents goes to their savings. We are teaching them to not spend everything they’re given. Depending on the age of your children, showing them how far money goes (or doesn’t go) at the grocery store is a good lesson. Give them a budget to feed your family for a meal or a few meals and then have them plan, shop, and buy the food. Like most things, we don’t understand them well until we have to do them. My children HATE when I take them to Aldi to buy groceries. It’s the least fun shopping place for children. Every time we go there, I tell them again how much money we save when we shop at Aldi and how it allows us to do other things (like sign up for basketball or eat dinner out after church). Tangible versus abstract helps establish money sense at an early age. I want to raise kids who make wiser financial decisions than I did. Wouldn’t it be great if our kids never had to write (or read) a series like this or the books above? Dream big, parents. I wish I could end this series by telling you we have millions of dollars in the bank and complete financial security now. But that’s not the case. I’m still learning–even through all of this–that I rely too much on the false sense of safety I get with money. So God and I, we’re still working on that. I’m still tempted to occasionally want things we don’t have the money for and I start scheming about ways I can make it fit in our budget. Old habits die hard, friends. But you just keep on practicing what you know is right and just take it one day at a time. I don’t know if that’s super-helpful, but it’s the truth.